Crooked teeth are a significant concern for your long-term oral health if not addressed. Fortunately, orthodontic braces have long provided an effective solution for correcting them and reducing the risks of such concerns. However, for many patients in North Hollywood, the potential inconvenience of wearing metal braces can make the question whether or not they should wear them. Fortunately, Invisalign® clear aligners offer a highly discreet and much more convenient way to correct teeth. Today, we take a look at how Invisalign® works and why it’s such a successful alternative to traditional braces. Instead of applying gentle pressure through brackets and wires, Invisalign® aligners are designed to gently force your teeth to match their shape. As you progress through the aligners, they continue guiding your teeth until the treatment is complete. 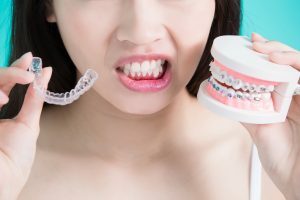 The fact that the aligners don’t rely on brackets and wires and can be removed when necessary means they can accomplish their goals of straightening your teeth much more conveniently. As long as you wear your aligners for the prescribed amount of time each day, you can temporarily remove them to make tasks such as eating and cleaning your teeth much simpler. If you want a straighter and healthier smile, then find out if you qualify for Invisalign® clear aligners as an alternative to traditional braces. For more information, schedule a consultation by calling Modern Smile in North Hollywood, CA, today at 818-763-9353. We also proudly serve patients who live in Burbank, Toluca Lake, and all surrounding communities. Is Invisalign® Really More Convenient than Braces? When you find out that your teeth are crooked and you need orthodontic treatment to straighten them, several different things can run through your mind. The first may be concern over how braces might make your smile look, especially if your confidence is an important part of your career. However, other concerns often involve how wearing braces could affect your daily life, from what you eat to how difficult it is to brush and floss your teeth. Fortunately, many patients in North Hollywood, CA, can straighten their teeth with Invisalign® clear aligners rather than traditional orthodontic braces, which can make their treatment significantly more comfortable and convenient. The secret to Invisalign® aligners is that, instead of brackets and wires, they shift crooked teeth using their innovative, highly precise designs. The aligners come in a series that you cycle through in the course of your treatment. Each one moves your teeth until they meet the aligners shape, then the next aligners continue moving your teeth until they’re all in optimal, symmetric positions. 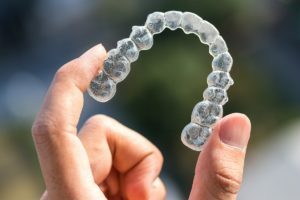 The aligners are made from clear, biocompatible acrylic, which makes them nearly invisible, and because they’re constructed as single appliances, you can easily remove them when necessary. The most notable benefit of Invisalign® is that the aligners are virtually invisible so no one will notice that you’re undergoing orthodontic treatment. However, the aligners can be temporarily removed for certain actions, which makes them as convenient as if you weren’t wearing them. Simply take them off before brushing and flossing your teeth, and then place them back again after you’ve cleaned them. This helps ensure that you can successfully keep plaque and tartar at bay to prevent them from causing tooth decay, gum disease, or more. The fact that Invisalign® aligners are temporarily removable makes them as convenient as they are discreet. For more information, or to find out if Invisalign® is right for you, schedule a consultation by calling Modern Smile in North Hollywood, CA, today at 818-763-9353. We also proudly serve patients who live in Burbank, Toluca Lake, and all surrounding communities. Sometimes, accepting the fact that your teeth have become crooked can be difficult. That’s especially true if you’ve never had to undergo orthodontic treatment before. However, crooked teeth can occur at virtually any point in life, and if ignored, they can pose a significant threat to the rest of your oral health. Fortunately, patients in North Hollywood can avoid the consequences of crooked teeth and still maintain their smile’s natural appearance with the help of Invisalign® clear orthodontic aligners. Children can often experience issues that affect the alignment of their teeth as they’re still developing and erupting from the gum line. To address them, children are often prescribed early orthodontic braces to correct their alignment. Because crooked teeth (or malocclusion) often occurs early, many patients believe that only children need orthodontic treatment. However, even previously straight adult teeth can grow crooked for a variety of reasons, such as tooth loss, an impacted wisdom tooth, bruxism (chronic teeth-grinding), and more. Despite the age at which malocclusion occurs, ignoring the condition can lead to increasingly worse dental health issues. 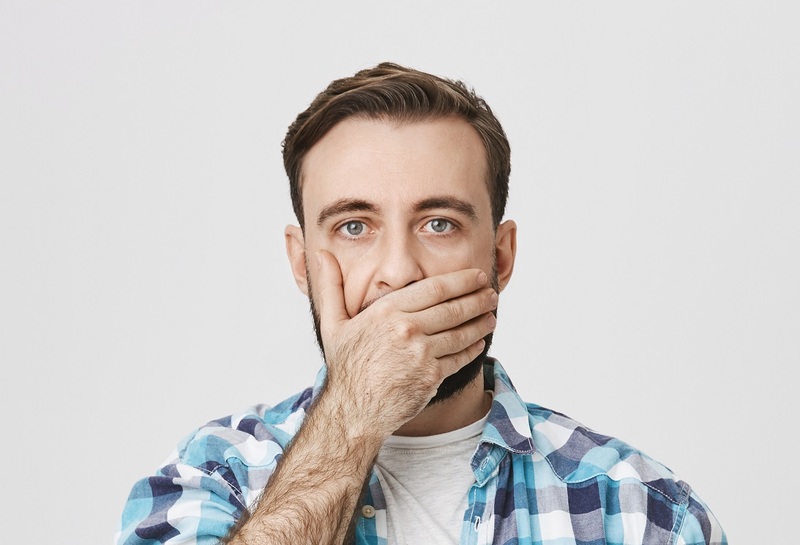 For example, crooked teeth make it more difficult for the other components of your bite to work, including your jaw muscles and joints (TMJs). If ignored, the imbalance in your bite can lead to damage in your TMJs, worsening malocclusion, and a wide variety of accompanying symptoms. The good news for adults with crooked teeth is that they don’t always require traditional, metal braces to straighten. With Invisalign® clear aligners, you can gradually and discreetly guide crooked teeth back into their desired alignment, all while remaining virtually invisible. Unlike braces, clear aligners are temporarily removable, which makes them easier to clean and maintain. Your teeth can become crooked for a wide variety of reasons, but you may be able to straighten them and avoid more smile trouble with the help of Invisalign® clear aligners. For more information, or to find out if Invisalign® can correct your crooked teeth, schedule a consultation by calling Modern Smile in North Hollywood, CA, today at 818-763-9353. We also proudly serve patients who live in Burbank, Toluca Lake, and all surrounding communities. If your dentist notices that your teeth aren’t aligned properly during your routine dental examination, then correcting that alignment could be essential to protecting your long-term oral health. However, for older teen and adult patients, the idea of wearing conspicuous metal braces every day to school and work can seem highly inconvenient, to say the least. That fear causes many patients to skip braces, which can lead to much more serious dental health concerns down the road. 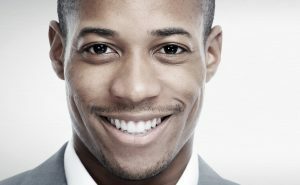 Fortunately, patients in North Hollywood, CA, who wish to avoid conventional braces can often find the solution they need in custom-designed Invisalign® aligners. One of the reasons patients hesitate to wear braces is because they worry how they’ll make their smile look. However, the problem with crooked teeth goes beyond esthetics, and choosing orthodontics is about more than just improving your smile’s appearance. It’s also about correcting the way your bite functions so that your teeth and jaws aren’t damaged by excessive bite pressure, stopping teeth from shifting further out of alignment, and preventing further complications. Nevertheless, appearance is important, and one of the biggest benefits of Invisalign® clear aligners is that no one else can seem them. Unlike braces, clear aligners are solid, one-piece appliances that are secured in placed over your teeth. They’re made from virtually invisible acrylic and designed to fit firmly over your teeth to remain unnoticeable throughout the course of your treatment. For optimal convenience, you can also temporarily remove the aligners to eat and clean your teeth, making routine hygiene simpler and more effective, as well. If you need to correct crooked teeth but prefer to avoid traditional metal braces, then find out if Invisalign® can help you achieve both. For more information, or to find out if you qualify for Invisalign®, schedule a consultation by calling Modern Smile in North Hollywood, CA, today at 818-763-9353. We also proudly serve patients who live in Burbank, Toluca Lake, and all surrounding communities. 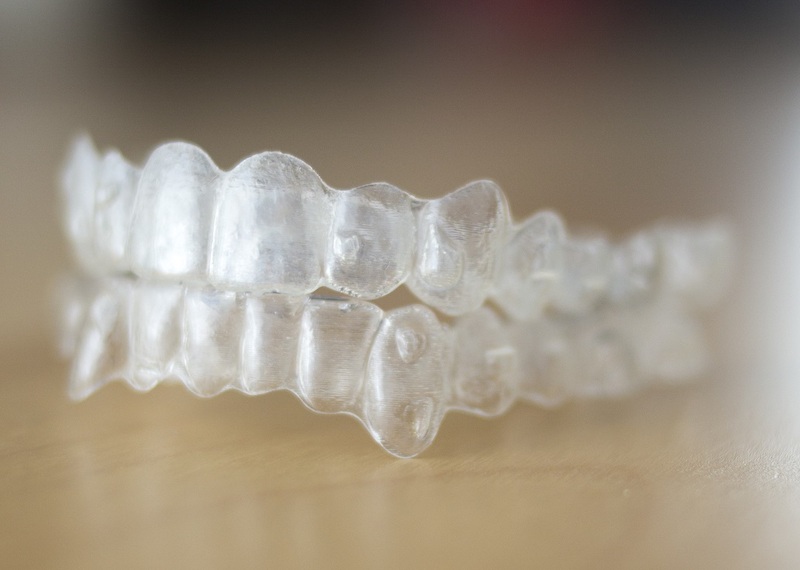 How Easy Is It to Care for Invisalign® Aligners? Invisalign® clear aligners offer a wide range of benefits to patients who need to straighten misaligned teeth. 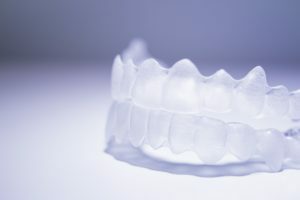 For example, aligners are made from clear acrylic and slip onto your teeth easily, rather than brackets and wires that are semi-permanently bonded to your teeth. This means your aligners won’t be nearly as noticeable as traditional braces, allowing you to remain more confident throughout your treatment. It also means that caring for your Invisalign® aligners is much simpler than caring for conventional braces, and therefore, they’re easier to maintain throughout the course of your orthodontic treatment in North Hollywood, CA. Clear orthodontic aligners are a conservative and comfortable alternative to traditional, bracket-and-wire braces. Unlike traditional braces, they don’t require the brackets and wires to move your teeth. Instead, the aligners are designed to gradually guide your teeth into proper position as you cycle through them every couple weeks. Patients who wear Invisalign® aligners can take them off temporarily to eat, or to brush and floss their properly every day. 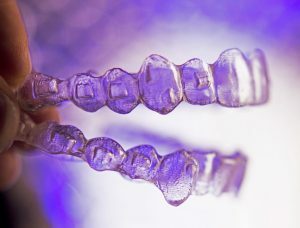 Besides appearance, optimal comfort and convenience are main focuses of Invisalign® treatment. For instance, caring for the health of your teeth and gums is easier because you can remove the aligners before brushing and flossing your teeth. This also means you can clean and soak your aligners more effectively to remove harmful oral bacteria, food particles, and more, all without needing special cleaning equipment as you would with traditional braces. Learn About Caring for Your Invisalign® Aligners? In addition to being virtually invisible while in place, your Invisalign® aligners will also make your treatment much more convenient with their easy care and maintenance routine. For more information, schedule a consultation by calling Modern Smile in North Hollywood, CA, today at 818-763-9353. We also proudly serve patients who live in Burbank, Toluca Lake, and all surrounding communities. For patients with visibly crooked teeth, Invisalign® clear aligners can provide many different benefits over traditional braces. One of the most noticeable of those benefits is the fact that Invisalign’s aligners are virtually invisible, making them a much more cosmetically appealing option. Because they’re more discreet and convenient than traditional braces, clear aligners encourage more patients to straighten crooked teeth than would otherwise do so – which is the most impactful benefit. Today, we examine why patients in North Hollywood who wear Invisalign® braces give their smiles a significant advantage in their long-term oral health. Even when crooked teeth aren’t obvious, the fact that they aren’t aligned properly can have a dramatic impact on how clean and healthy you can keep them. For example, the small, unnoticeable overlaps between crooked teeth can give harmful oral bacteria to hide where your toothbrush and floss can’t reach. After you’ve completed Invisalign® treatment, your teeth will be straighter and easier to keep clean and healthy, along with being more esthetically pleasing. Crooked teeth easily harbor harmful plaque, but they have difficulty when it comes to keeping your bite balanced. Every time you bite and chew, the pressure of your bite is distributed among each of your teeth. When they’re crooked, your teeth disturb this balance, which can expose them to levels of pressure that can lead to tooth damage. When straight, your teeth can easily absorb this pressure without sustaining damage. If you do develop a concern such as tooth decay or gum disease after your Invisalign® treatment, then the fact that your teeth are now properly aligned will make addressing the concern easier and more successful. After restoring a tooth or restoring health to your gum tissues, your dentist can ensure the health and appearance of your smile in conjunction with your straighter, more functional teeth. Invisalign® offers a variety of benefits, but the most important one is that it effectively straightens crooked teeth and helps you avoid the complications associated with them. For more information, schedule a consultation by calling Modern Smile in North Hollywood, CA, today at 818-763-9353. We also proudly serve patients who live in Burbank, Toluca Lake, and all surrounding communities. When your teeth are obviously not aligned properly, the cosmetic effect it can have on your smile’s appearance can be a significant one. 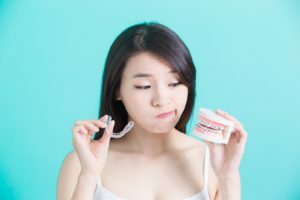 The trouble for many patients, though, is that metal orthodontic braces don’t always seem like a more attractive option. If appearance is the main concern, then patients may be more likely to neglect correcting the problem. Invisalign® clear aligners eliminate that concern by remaining discreet and unnoticeable when placed over your teeth. Therefore, one of the biggest ways patients in North Hollywood, CA, benefit from Invisalign® is by gaining the confidence to straighten their crooked teeth so they can enjoy better oral health for life. Invisalign® clear aligners don’t consist of noticeable brackets and wires like traditional braces. Instead, they consist of a custom-designed, virtually invisible aligners that slip comfortably over your teeth, gradually guiding them toward more symmetrical positions. The aligners are designed specifically to remain undetectable so you can enjoy a greater level of confidence throughout the course of your treatment. Besides looking better, Invisalign® aligners are also temporarily removable. Because they slip over your teeth, they aren’t semi-permanently bonded in place like brackets and wires. This means you can take your aligners off before you eat so you can continue to enjoy your favorite foods without worrying about anything sticking in your braces. You can also remove your aligners before brushing and flossing your teeth so your toothbrush and floss aren’t impeded by them. This means you can clean your teeth and gums more effectively without needing additional tools such as an interdental cleaner to brush and clean around your braces. Because your hygiene routine is simpler and more successful, you can also enjoy a reduced risk of issues such as tooth decay and gum disease. If your teeth aren’t properly aligned, then Invisalign® clear aligners may be a better option for your smile than traditional orthodontic braces. For more information, schedule a consultation by calling Modern Smile in North Hollywood, CA, today at 818-763-9353. We also proudly serve patients who live in Burbank, Toluca Lake, and all surrounding communities.